Love is precious and rare, stories say. So is a film like Love, Simon, a sweet and funny coming-out story that’s also a relatable coming-of-age tale and teen romantic comedy. 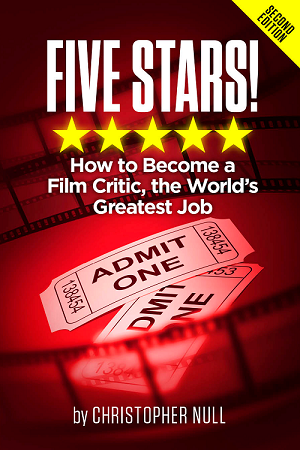 There’s a temptation if not a tendency in films about acceptance to feel preachy or cloying. 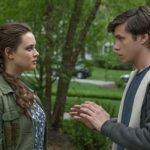 Love, Simon is sincere and heartfelt without patting itself on the back. Simon (Nick Robinson) is 17-year-old in suburban Atlanta who has long-married parents and a younger sister he actually likes. Cool friends, including a girl he’s known since kindergarten. And he’s counting the days until high-school graduation. He also has a huge secret, gazing out the window at a hunky male landscaper instead of peeking at supermodel bikini shots on his laptop, like his dad (Josh Duhamel, the Transformers franchise) jokes that he’s ogling. We soon learn that Simon is writing to a fellow student with the online name Blue. Blue is brave enough to confide on a school blog that he’s gay but not ready to announce it publicly. Simon feels a kinship to this conflicted soul in hiding, and the two become pen pals. One of the film’s mysteries is who this secret correspondent will be. Love, Simon is based on the award-winning book Simon vs. the Homo Sapiens Agenda by former psychologist Becky Albertalli. Screenwriters Elizabeth Berger and Isaac Aptaker (both from TV’s This Is Us) balance poignant moments with genuine humor and of-the-moment dialogue. Yet certain viewers might be reminded of the humbling awkwardness of John Hughes films (Sixteen Candles, The Breakfast Club). Director Greg Berlanti, best known as the producer behind TV’s Arrow, The Flash, Supergirl, Legends of Tomorrow, and Riverdale, captures realistic and endearing performances, from Duhamel and Jennifer Garner (Wakefield) as Simon’s mom to the ensemble of Simon’s friends. We know soccer player Nick (Jorge Lendeborg Jr., Spider-Man: Homecoming) likes Abby (Alexandra Shipp of X-Men: Apocalypse), the new girl from DC, because he remembers she likes milk in her iced coffee. Abby is oblivious, as is Simon when longtime friend Leah (Katherine Langford, TV’s 13 Reasons Why) notes that she’s interested in only one person. Guess who that might be? When Simon hurries off a library computer one day, he accidentally leaves his email exposed, and Martin (Logan Miller, Before I Fall), an obnoxious but insecure theater geek, sees an opportunity. He threatens to release screenshots of the messages unless Simon helps him get to know Abby a little better. Simon could diffuse all this by coming out, but he’s not ready for the changes in his life this might bring. Plus, he doesn’t want to want to expose Blue. Their messages are a safe space, where they can talk and feel understood. Part of the film’s charm is how it dramatizes Simon imagining whom his pen pal is, triggered by a line from Blue’s emails. 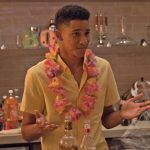 Is it Bram (Keiynan Lonsdale, Insurgent, TV’s The Flash), the athlete at their lunch table? The band’s pianist (Miles Heizer, TV’s 13 Reasons Why)? Another classmate (Joey Pollari, TV’s American Crime) who works as a waiter? Love, Simon also has fun illustrating some of Simon’s thoughts as he types. When Simon wonders why being straight is the default, a hilarious montage follows with friends declaring their heterosexuality while relatives sob and wail. Another time, Simon imagines that he’ll be openly gay once he’s in college, cueing a rainbow-colored dance number. “Maybe not that gay,” he decides. Duhamel and Garner are easygoing parents who cuss a bit but don’t try to be their kids’ best friends. When Simon comes home drunk, they talk anxiously before chalking it in the win column because he didn’t drive and he’s home before curfew. The teachers are loonier, as they tend to be in teen comedies. Natasha Rothwell (TV’s Insecure) is the drama teacher, a Lion King extra who now coaches the kids through Cabaret. Tony Hale (TV’s Arrested Development, Veep), the daft vice principal, gives advice that’s one step forward, two steps back. “Enough with the selfies. You’re not all that,” he says, confiscating cell phones in the school hallways. The film wouldn’t work without us feeling invested in Simon, and Robinson is a revelation. He’s been a teen romantic lead before, in Everything, Everything, and outrun dinosaurs as a snarky teen in Jurassic World. Here, he’s so natural and unaffected, charming with a rakish grin that can turn shy or grimacing in discomfort. From small gestures to quiet anguish to erupting in anger, every emotional bit feels honest and earned. He doesn’t hit one false note. Teens in my screening laughed at all the right moments, and even applauded at the end. “Announcing who you are to the world is pretty terrifying,” Simon admits, an identifiable sentiment no matter what your situation. You might love Simon, too.